Ah Geocaching – You may have never heard of it, or have and don’t play it or you are a GEOCACHER! You can be a Geocacher from any country and it is a global game which means you can play it at home or abroad: How awesome is that? Now to answer the question you might be asking, Yes I am a Geocacher but I’m nowhere near prolific compared to many others. I often hunt out geocaches when I travel abroad as many are placed in areas of significance but not the norm for a tourist to visit, exploring a place of interest and/or beauty. Of course, I have found geocaches in my local area and actually own one myself after adopting it from a fellow geocacher – I walk pass the location 2-3 times a week and I do not live far that any maintenance/replacement can be done fairly quickly. If you have watched the video at the top of the video then you have learned what geocaching is and if you haven’t – Go watch it! It is an activity for all abilities, whether you play regularly or not. I am able but I have also been out with groups of people with a range of disabilities from being blind, in a wheelchair, learning and mental – It really is an inclusive activity. As the video states, geocaches range in size, containers and difficulty. Thy can be small nano containers which are magentic, or large containers with treasures that a pirate would be proud of. You can be taken into the centre of a city filled with lots of people or into the hills, where there are less people. Those whom don’t know of this game are known as “Muggles” and the aim is to grab a geocache (cache for short), sign the logbook and return it as exactly as you found it without being discovered – Trickier than you think! However, whilst many find enjoyment of being a ninja, if you get the odd look, lack subtlety or just want to celebrate your acheivement, it is okay! (Seriously, it is.) Just remember, other geocachers maybe near by and you want them to have the same journey or discovery as you did, as it’s all part of the fun. Some of the hiding places are very ingenious, so if you think something might be a little crazy, check it! What do you need? The answer is is the video, either a phone with GPS or a GPS device and many people find that the latter are often more accurate but both devices will encounter similiar problems and that is mainly sateillite coverage. If you go to find a cache in the woodlands and their is a lot of folliage, expect the ‘distance’ to be off and when you get within 30ft of the cache location, start looking. I have got 2ft within a cache location before according to the GPS and the cache itself was actually about another 10ft away. These things like many aspects of the game will come to you in time, also learning new little things that build up your experience, skills and knowledge of the game. There are many tips out there and a large community to support and share stories. Each geocache will have a little information on them about the cache itself, maybe a handy hint (if you are struggling) but it is also handy to read previous logged comments by other geocachers too. Yorkshire Wildlife Park, a place I have managed to schedule a visit to twice in extreme weather – An endless torrent of rain and the heat that just won’t quit. The images from this latter visit feature in this post and suprisingly, the Polar Bears seemed to enjoy this weather the most as they swan in the lake whilst most of the other animals seemed to be sleeping through the hot day or had hidden themselves completely in the shade or any shelter they could find. A nice game of eye spy! Located in South Yorkshire on the outskirts of the town of Doncaster, the YWP is well-signed posted off major motorways so it isn’t easy to get lost. YWP is relatively new having only officially opened in 2009 and as of 2016, boasts a number of animal enclosures and an even wider variety of animals of all sizes from across the globe. With so much to see with talks held throughout the school holidays and some weekends, you can easily spend the day here with a number of cafes, play areas and picnic places to cater for families and any hungry bellies! With the Rio 2016 Olympics and Paralympics summer games starting today, I thought this would be a good time to have a couple of flashback posts to the London 2012 summer games, which I was very fortunate to attend and live in the country that was hosting this magical, sporting event. 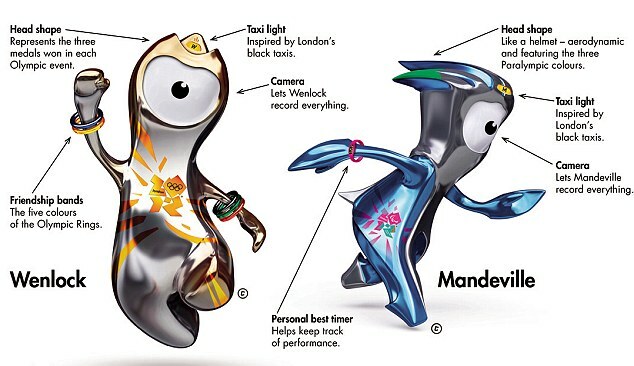 The mascots Wenlock and Mandeville represented the Olympic and Paralympic games respectively, their names and design based in British history and culture. Wenlock’s name is inspired by Much Wenlock in Shropshire, England, where in 1850 the Wenlock Olympian Society held its first Olympian Games, regarded as an inspiration for the modern Olympic games. Mandeville is named after the Stoke Mandeville Hospital in Aylesbury, Buckinghamshire. In 1948, Stoke Mandeville organised the first Stoke Mandeville Games, considered to be the precursor to the Paralympics. The three spikes on Mandeville’s helmet represent the Paralympic Agitos. He also represents friendship. During the summer, London placed 83 figures all over the city to promote the games and to encourages locals and tourists alike to explore the city on foot. Each figure was designed to represent the area that it had been placed, as you can see from the images below. Out of the 83, I only spotted 6 on my travels across the city or maybe I just wasn’t looking hard enough! 2016 is here and now, so am I! Today, I have been updating a couple of my side blogs which don’t need to be updated so often and I now I will start on this one. You might not see anything for a while as I work on uploading lots of images from my trip to Budapest, Hungary over the New Year as well as related information on my experience. There are also other posts that I will be working on as well and once I am on my way, be sure to see some posts arriving 2-3 times a week. Then the question? Where next? Not only my own travels, but post wise too.